On Wednesday August 20th a day of “observation” was allowed inside the corrals at Virgin Valley. Observers were taken to a gravel and rock mound and allowed to photograph from that mound the horses and burros captured. Observation lasted from 10am until noon. Adoptions are not done “in house” by USFWS as they are with BLM horses. To adopt a horse or burro you must contact one of the adoption contractors listed below. At this time we can not confirm which horses all go to what contractor, except that it is expected for mares and foals to go to Midland, Texas. 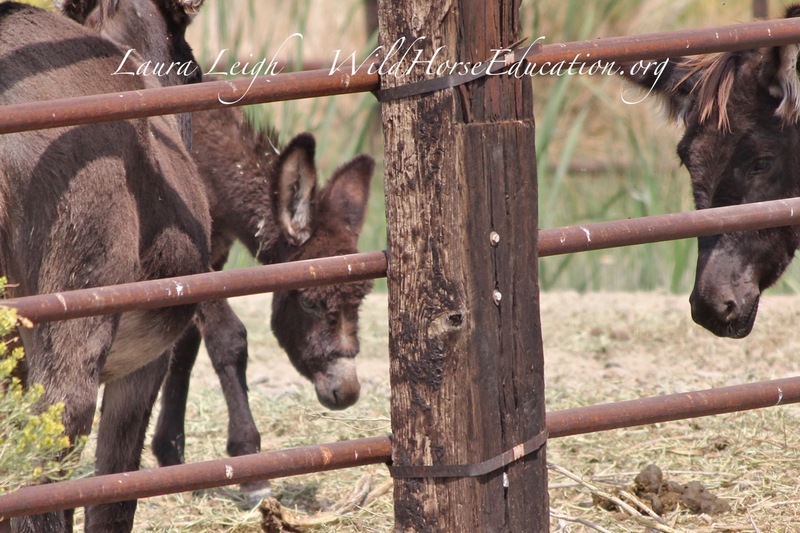 All burros will go to Peaceful Valley Donkey Rescue in Oregon. Sheldon horses and burros are not branded, but registered with a microchip. At the time of adoption you should be provided with information on how to register your horse or burro. Burros were removed starting July 14 and a few more taken at this current operation. You can adopt a burro from Peaceful Valley in Oregon. The second phase, or “clean up,” is expected to occur sometime in September and yield and additional 100 mustangs. Info will be provided as it is confirmed. We are having technical difficulties and will mark photos (male, female) as we can. Yes, there is a collared mare but we have no further info.